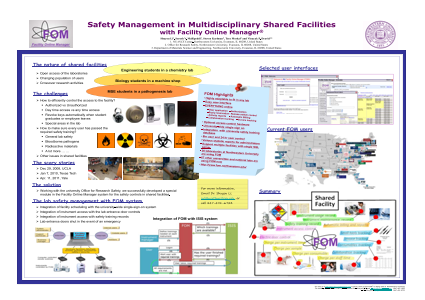 Abstract: Research safety management is a major challenge in shared facilities. This has been especially realized after the recent tragedies at UCLA, 2008[1,2] and Yale University, 2011. The unique challenges of safety management in shared facilities stem from the nature of the facilities, (a) the open access of the laboratories, (b) the constantly changing population of users, and (c) the crossover research activities. Most shared facilities provide open access to faculty, staff, or students. The keys, whether conventional or digital ID cards, are massively distributed to 24-hour users. It is very time-consuming for the lab managers to keep track of who has access. These keys and ID cards are frequently not returned when users leave the institution. During business hours, the shared facilities may not control access, which allows anyone, authorized or not, to enter the shared facility. It is not uncommon to see engineering students working in a shared facility with highly toxic chemical reagents, or biology students working in a machine shop with power equipment. Many of these students have little or no prior experience working in such environments. Worse yet, some of their supervisors do not have the background to provide safety guidance for their students. Many institutions, such as Northwestern University, provide the proper safety training. However there is no efficient way to ensure every shared facility user is properly trained before accessing the multidisciplinary shared facilities. In this paper, we summarized the safety measures that we have implemented so far at the NUANCE Center, Northwestern University. Hopefully this will initiate an extensive discussion over the safety controls in shared facilities. We are interested in hearing how other institutions address safety management for shared facilities during the platform discussion. The safety measures described below are mainly fulfilled with the Facility Online Manager (FOM®) software , which is copyrighted by Northwestern University. (1)	Integration of facility scheduling with the university-wide single-sign-on system. Only authorized users may see the calendar, book time, and access the resources in a facility. (2)	Integration of instrument access with the lab entrance door controls. Only authorized users may enter the lab after working hours. All the enter-exit events are recorded in a central database. As soon as a user is suspended from the instrument access, the corresponding key card is suspended as well and cannot open the lab entrance door anymore. (3)	Integration of instrument access with safety training records. The instrument access is dynamically linked with the Integrated Safety Information System (ISIS). Each instrument manager defines what safety training is required for each instrument. Facility users will see what safety training is required when they login to the FOM system. Course completion is verified through the link to ISIS. Once a training requirement is complete and updated in the ISIS system, the corresponding user’s record will automatically be updated in FOM. A user cannot be granted access to an instrument until all the safety training requirements have been met. (4)	Lab entrance doors shut in the event of an emergency. In an emergency, as soon as the building fire alarm sounds, the lab entrance doors are automatically locked. Workers in the lab can freely exit the lab, but the door cannot be opened from outside except by police and firefighters. (5)	More details will be presented at the meeting. Summary: Facility Online Manager is a software that concentrates on the scheduling, collaboration tracking, and billing/reporting. In this paper we present one module of the system highlighting the safety training management, which is a very important for every scientific research lab.References:  K. Christensen, http://articles.latimes.com/2009/mar/01/local/me-uclaburn1, Mar. 1, 2009. D. Blum, http://www.wired.com/wiredscience/2012/07/sangji-chemistry-death-ucla/, Jul 31, 2012. R. van Noorden, http://www.nature.com/news/2011/110418/full/472270a.html, Apr. 18, 2011.